Many consider the Heights to be the stronghold of the Democrats in the Houston political scene. But this past weekend, 19th Street in the Heights (Home of Sheila Jackson Lee's district office) turned into the scene of a Republican campaign juggernaut. The event was the Heights White Linen Nights Festival. An annual affair that attracts celebrants to a time remembered from days gone by. The corner drug store, family owned restaurants, businesses where you actually know the business owner, and yes, political candidates who actually come out and listen to the people they want to represent. The Heights is a key component of the 18th Congressional District. A seat campaigned for by a constitutional conservative candidate, John Faulk. 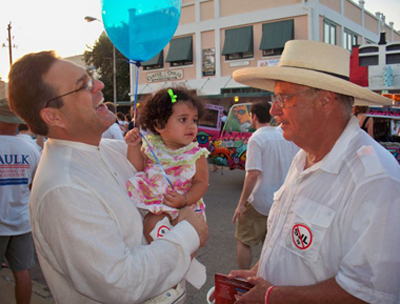 The White Linen Nights event was the perfect opportunity to take the campaign to the streets and talk to and listen to a wide variety of people and issues. 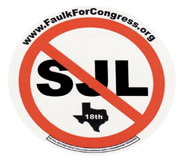 Many volunteers joined with Faulk in distributing the now infamous "No SJL" sticker that has become synonymous with the Faulk campaign. People were bringing their children by for the stickers. Many returned for more, either to replace ones swiped by their friends or to get more to hand out. 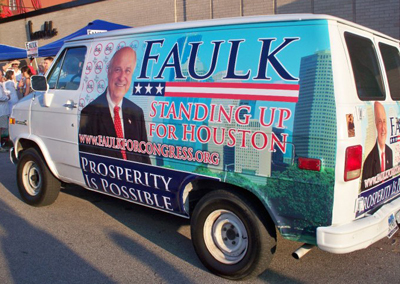 The "sticker" shows the vulnerability of Faulk's opponent. But more importantly, they give Faulk more and better opportunity to meet people and earn their trust. And, after all, isn't that what campaigns are really all about? Earning the trust of the people to obtain their vote? The festivity of the event was abundant. 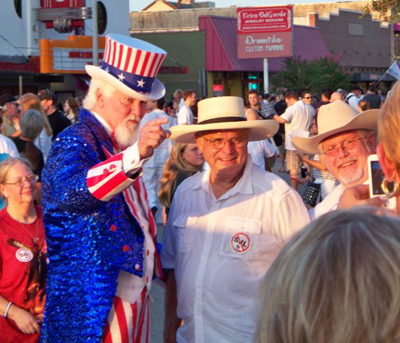 An 8' tall "Uncle Sam" wandered around posing for pictures and drawing a crowd. A country western band played classic Texan music, some of which customized to the Faulk campaign. And, free popsicles and cold water brought in even more seeking relief from the Heights hot evening event. Joining Faulk on the streets of the Heights were Texas Senate District 15 candidate Bill Walker and Texas House District 148 candidate Fernando Herrera. 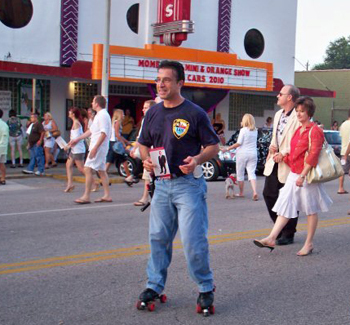 Herrera, a Houston Fire Department, Deputy Chief, is employing a unique campaign style of roller skating his way to success! He was clearly a hit on 19th St. The Heights are important to all three of these candidates. By working together they are sending a message about what true conservatives have to offer the voters of Texas and these districts. They represent a powerful team of conservatives who have the power to greatly change the face of the Texas and national political landscape. Visit Faulk's Campaign Website to learn more about the issues facing the Heights and the rest of this district. Read "Sheila Jackson Lee Flaunts New Bailout HR1586, and John Faulk Steps In To Teach Consequences of Government Overspending"